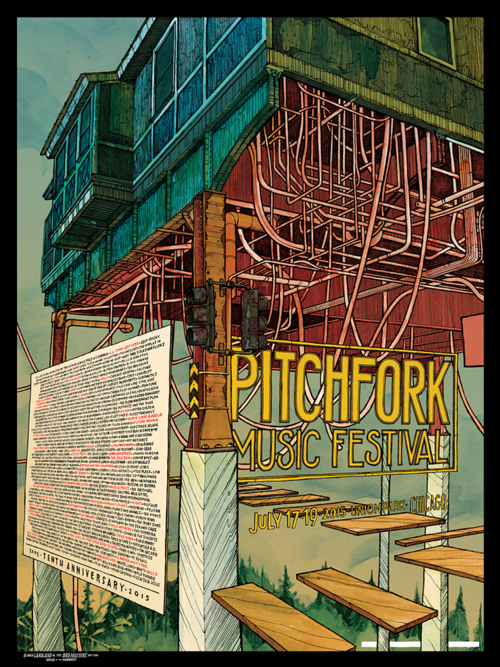 Jay Ryan and Landland will release their collaborative poster for the Pitchfork Music Festival later today (one of the best concert posters of the year so far, imho). It’s an 18″ x 24″ screenprint, has an edition of 880 (much, much less online), and will be very affordable (price not confirmed yet). These go up today (Monday, July 20th) at 1pm Central Time. Buy one via TheBirdMachine.com or Landland. These came out great and were 30$ at the merch tent. The colors are a lot more rich than this photo indicates. We chatted with Jay Ryan at his flatstock tent, and he said they didn’t start printing them until Wednesday, two days before they went on sale.